Okay, it has been pointed out to me that I have already posted "Chemo-girl." So, I was just reviewing a little bit so you don't lose track of what I have done! Now this toon was a special present for Joel on his 21st birthday. I researched and placed many quotes from his favorite philosophers. It is acutally kinda hard to read, but my goal was to use the written portion to create visual texture. I think I accomplished that, but this would be a good concept to try again sometime. 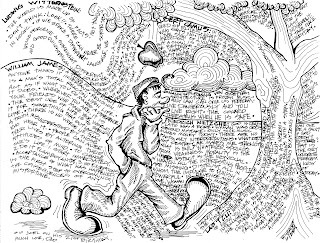 I really like the character, walking along, pondering the cosmos, about to discover that gravity works (falling apple). He is rather R. Crumb-ish. The concept is really quite simple, but one can spend a long time looking at it, trying to get the quotes. 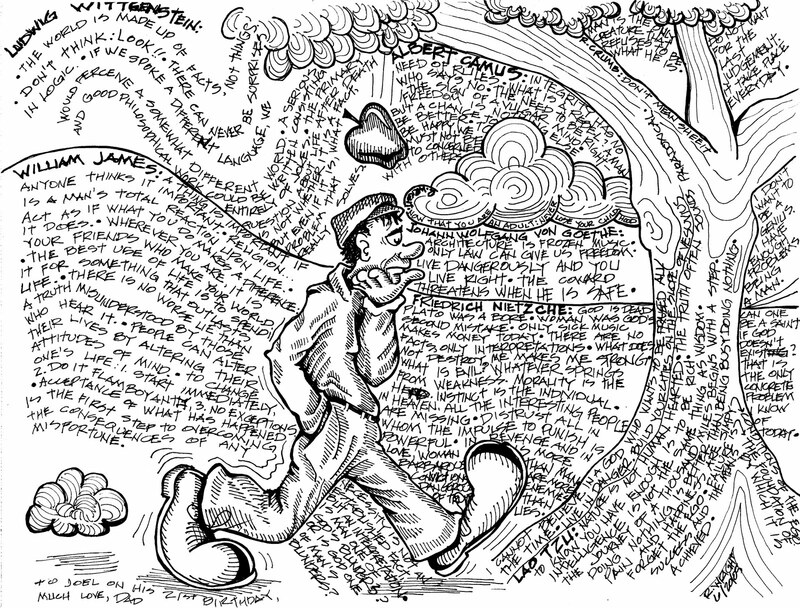 By the way, my favorite quote is by R. Crumb himself. Try to find it. I know! I know where it is!